Have you started thinking about what you may want or need to change when it comes to your business? Who would be your best source to go to to get great feedback from so you know exactly what changes need to be made? Your customers of course - they are the best product testers you will ever have - they are the ones purchasing and using your products and services and will provide the most accurate feedback as to what may be working and what may not be. When you think of ClassMarker, the first thing that may come to mind is giving exams to Test and train your employees or to quiz your students. While ClassMarker does provide an advanced online testing system that is used to meet your testing requirements, there is also another way that you can use ClassMarker. You can also use our online testing platform to find out what your customers think by Creating Customer Satisfaction Reviews. Here at ClassMarker, we love to hear suggestions and feedback from our customers. After all, they are the ones that use our service day in and day out - what better people to hear from regarding what they would like to see, and what features they need or want added than the customer themselves. Your customer has just finished their meal at your establishment and is now presented with their receipt. Receipts, by the way are a great place to put notifications, promotions, etc., because the majority of customers DO look over their receipts. I think this is something that we all do, to ensure everything is correct. Your customer looks at the bottom of their receipt, maybe it says "Get 10% off your next visit" with a link below it, to your website. Who doesn't like receiving a percentage off of their purchase? If you were this customer, this has now probably piqued your interest to check this offer out. You now want to go to that link to see how you can receive your 10% off. This is also a great way to get your customers to your website to check out any other offers and promotions you may have going on. Because the ClassMarker works on all devices, such as PC, Mac, iPhone, iPad, Chrome Book, all smart devices, customers don't even have to wait until they get home. They can check out the offer and do the Customer Questionnaire while still sitting at their table, if they choose. On this page you would have your ClassMarker customer survey embedded and ready to fill in. Other suggestions of what you could add to the receipt - "Provide us with your feedback and receive a free appetizer the next time you stop by", "10% off your next meal", "Free desert for doing our review". Get creative!! With our Customizable certificates, you can create these as coupons or discount vouchers that once they complete the review, they can download and print a voucher for a free appetizer, 10% off of a service/product, the possibilities are endless. They can print these off and bring in with them the next time they come in. If you have them add their email address, they can have their Customer Feedback questionnaire emailed with the certificate download link to print off their voucher at a time when it's convenient for them to do so. 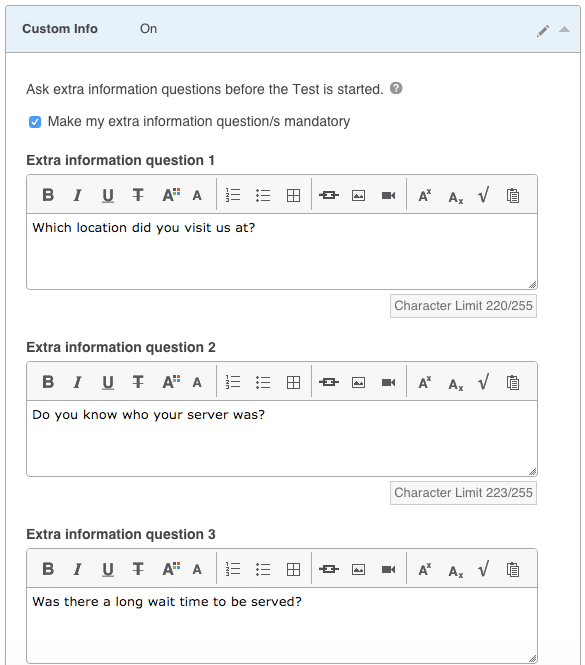 Mix up the review with some multiple choice questions and essay questions that users can enter who their server was - it's nice when customers can put things into their own words regarding the experience they have had. Offer a Customer Review right from your own site by embedding your review directly into your webpage. You can Brand your Customer Satisfaction Survey with your own background images/colors, company logo and you can even customize the colors of your links and buttons to match your website. When you embed your test, your customers will not see anything pertaining to ClassMarker, not even the URL. You can keep your reviews anonymous or choose to have them only add their first and/or last name and email address. You can also add 'extra information' questions where they can answer questions specific to the location they were at. You can ask what location they were at, who their server was, etc. As a customer, you want to know that if you provide customer feedback that it is being listened to and not just given to one person and then never spoken of again or passed on to the people who can do something with that feedback. With ClassMarker, you can create customized Customer Satisfaction Reviews to get the feedback you need.